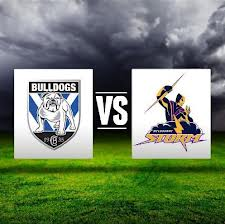 Last Sunday BANKSTOWN BULLDOGS TAKE ON THE MELBOURNE STORMS. Sam Casiano and Krisnan Inu thrown in some big hits and Sam Casiano got put on report for hitting someone in the face. The ref put him on report after that the BANKSTOWN BULLDOGS scored a try and then Krisnan Inu pushed Billy Slater . Then they started a fight, but the ref pulled out the fight. Billy Slater got bitten in the ears and could not stop bleeding so Krisnan Inu kicked the conversion and he missed and then the siren went for the end of the game and the MELBOURNE STORMS WINS:). I was kind of sad because my team the Bulldogs lost but at lease they had fun.